Looking for the perfect snack on-the-go? THIS IS IT. I promise. 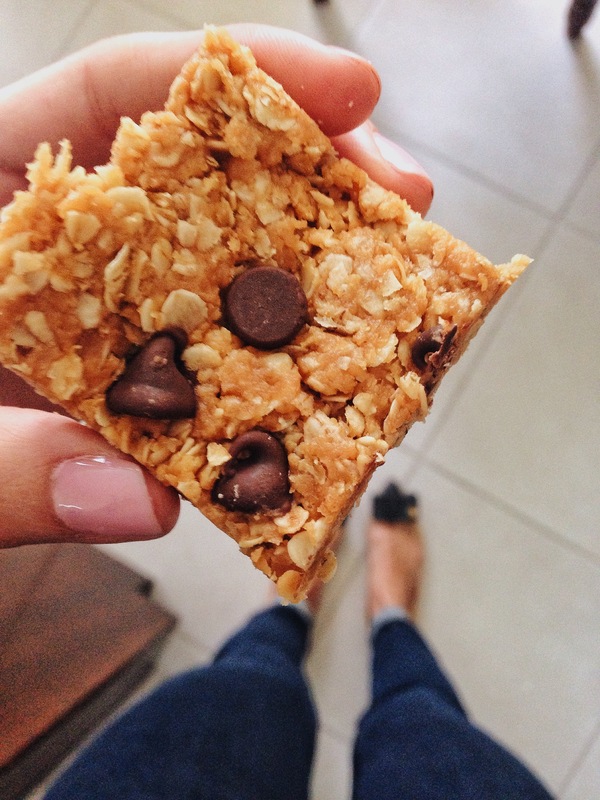 These tasty peanut butter & oats bars are a great way to pack a snack when you’re in a hurry. So many granola bars today have (WAY) too many different ingredients that just seem fishy. Like for example, how many times have you looked at the ingredients and actually have been able to pronounce the words? Natural is the way to go! These little snacks are filled with peanut butter and oats…AKA meaning good source of fats and fiber. Homemade granola bars are the way to go. Plus it’s SUPER easy!!! …Did I mention it’s an oven-free recipe! After you mixed everything together, spread your peanut butter granola into a pan. (Depending on the size of your pan will determine the thickness of your granola) Leave the pan in the fridge for a good 30 minutes to an hour. Then, enjoy! P.S. I added some chocolate chips to my batch. The best part of these home made goodies: you can add or take away anything you want or don’t want!